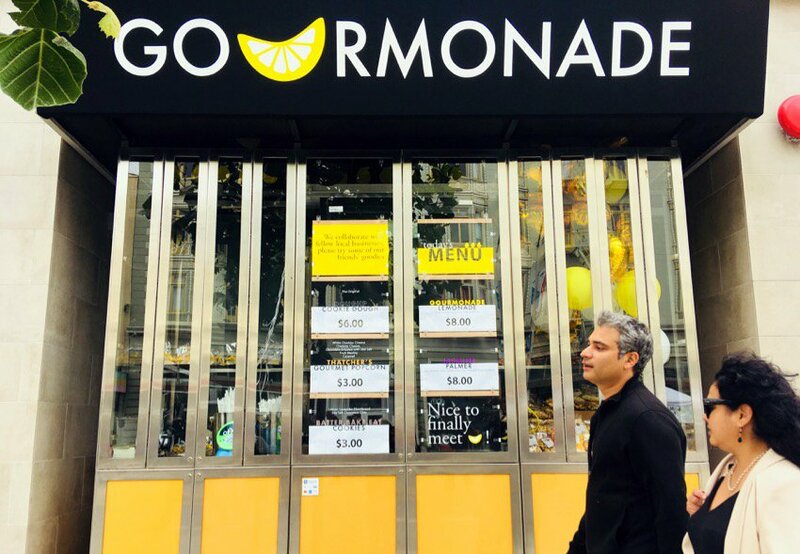 An African American man who, only a couple weeks ago, opened a gourmet lemonade business on Valencia and 20th Streets was confronted by police on Tuesday morning after they received a call that a person was trying to break into the bright yellow store. Vicktor Stevenson, the owner of Gourmonade, was just opening up his stand at 6:30 a.m. on Tuesday when he saw two cop cars crawling down Valencia Street. “It was putting me on edge and I was worried maybe something was going on,” he told Mission Local. One patrol car parked in front of him and the other behind him, he said. One police officer, he said, approached with his hand on his gun. “He looked like he was ready,” Stevenson said. Stevenson said he asked officers if they had responded to his security system — as he had been having issues with it, and was on the phone with the security company as the police rolled up. No, one of the officers said, they were responding to a call of a break-in. He told them repeatedly that the lemonade stand, which is part of the storefront of V20 condos, was his establishment. They then asked him to take his hand out of the pocket of the large skiing coat he was wearing. “I took my hand out and spread [my hand] like an eagle,” he said. To prove that he owned the stand, he opened the doors using his keys. Nonetheless, the officers asked for his identification card. He first gave them his Illinois I.D., but the officers asked if he had a California identification. He handed it over. When Stevenson asked why he would have to show his identification after proving that it was his business — and why their check was taking so long — an officer told him: “Sometimes people aren’t who they say they are,” Stevenson said. He indicated the officers were mostly polite, but he was alarmed at their repeated skepticism and the way one of the officers initially approached “at the ready” with a hand on his gun. The cops left shortly after they handed his identification back. “Thankfully I wasn’t put in handcuffs,” Stevenson said. He said that the incident was “without a doubt” a case of racism and racial profiling on the part of the person who called the police. The SFPD confirmed on Monday that officers received a call of a possible burglary. “The caller stated that the person was removing items from a small, open door,” said SFPD spokesman Sgt. Michael Andraychack. Four officers responded, he said, and left after they confirmed that Stevenson was the owner. “The encounter lasted three minutes,” he said. On Saturday, after hearing of the incident, Mission residents stopped by Stevenson’s shop to show their support. “At least 50 people came up to me through the day,” he said. NextGoogle executive Jack Halprin is dead. His former tenants are still facing eviction. A rogue employee at a Sacramento grocery store called the police on my friend for supposedly shoplifting deli meat while she was stocking up for a big camping trip. What am I missing? A 3 minute interaction with the officers (who were polite). Identity established. Police leave. End of event. This guy should be grateful that someone’s looking out for his business. Pulling the race card for every single thing is becoming tedious. I have to agree that there seems to be no story here. If the guy had been white, lighter brown, wearing a hijab, or a woman, tansgender… that it would have been the same process. Maybe I’m being naive but it doesn’t seem that the color of his skin had an impact on policy and procedure. Yes it was typical racist response! This may or may not have been much different treatment than a similarly dressed person of another race would have received, but that question, while important in terms of ensuring police are not routinely engaging in racial discrimination, obscures a larger point: Police officers have no business demanding anyone’s identification under such circumstances. The guy had already established it was his business; even if he had not, if there were no signs of a break-in or probable cause to view him as a suspect, that should have been the end of it. “Papers, please” used to be something you’d see the Gestapo demanding in old movies featuring Nazis, not something you would expect to encounter in the United States. This practice of stopping anyone, anywhere, any time and demanding they produce government ID is a threat to all of our civil liberties, and to basic freedom in this country. Government encroachments on our freedom happen slowly, a little at a time; if people don’t stand up and object, things are likely to gradually get worse.